Elegant 1920s — 1930s antique ‘Art Deco’ Chinese Rug with some wear across the wool pile. Side cords have wear and a few small repairs, which is perfectly normal for an antique rug. The fringes are short with minor end wear–especially at the corners. The rug was professionally ‘end-stopped’ (a button stitch is sewn by hand along the ends) some time ago, and this has protected the weft threads from any kind of unraveling. I was told the rug was washed and it seems clean with no odors or soiling. The primary colors are silver gray, a light taupe, and indigo blue in the border. There are highlights of violet and daubs of magenta in the foliage. A few butterflies wing their way across the open field (one shown in closeup). Despite the age and scattered wear, this is a rugged, well-made rug that can handle high foot traffic. 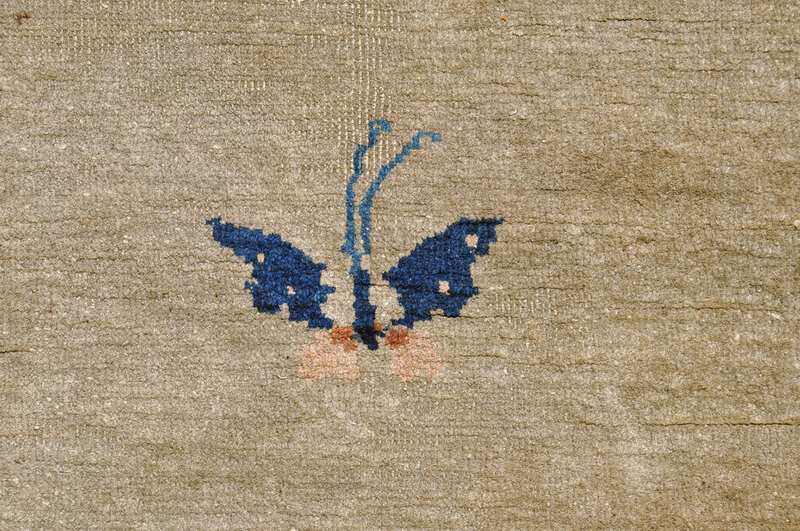 Nichols’ carpets and their kin are well known for their resilience. This is a perfect rug for someone comfortable with an antique that shows use, but has aged gracefully. Of course, after the expanded Japanese invasion of China in 1937, the enlargement of the Second World War, and then the Communist Revolution in mainland China in 1949, the era of the Nichol’s rugs ended. However, they continued to exert an influence on rug production in the People’s Republic of China. Very dense, solid weave. Heavy. Wool on cotton. Superb dyes that do not ‘bleed’. Large room size at 11 ft. 5 in. by 9 ft. 5 in. The price will be $895. Shipping is $70. Free pickup is an option, too. Please email me with questions or to arrange a purchase.Thank you.